Sam Houston State University students who have not seen the Vietnam Wall in Washington will have the opportunity to visit a three-quarter-scale replica of the memorial when it stops in Huntsville Nov. 4-7. 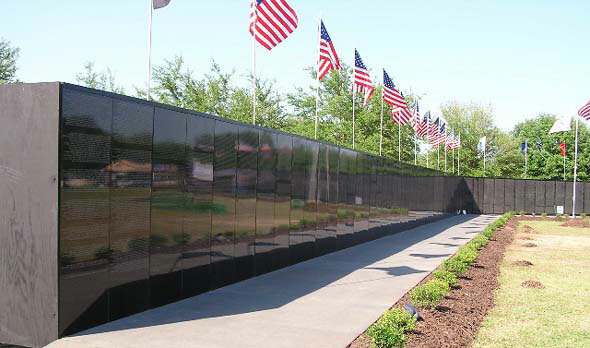 The 240-feet long black, mirror-like faux-granite replica is inscribed with the names of servicemen and women who died or are missing in Vietnam. It will be located near the Texas Prison Museum at Highway 75 and I45. Admission is free. Beginning Thursday (Nov. 4) at a 10 a.m. ceremony, and extending through Sunday (Nov. 7) hundreds of Sam Houston State University students will be standing vigil and serving as guides for thousands of elementary school children who are scheduled to visit the wall.
" SHSU's Webb History Society and ROTC units will be helping organize the massive vigil which will go on throughout all four days, 24-hours a day, to honor the Vietnam Veterans as well as the veterans of all our wars," said Caroline Crimm, SHSU history professor who is coordinating the vigil effort. "Sam students have signed up through their history classes, university clubs, fraternities, and sororities, and will be working two-hour shifts at the site, sharing the experience with Huntsville's veterans and the many visitors expected at the site." The SHSU ROTC color guard will participate in the opening ceremonies. James S. Olson, distinguished professor of history, who has written four books on the Vietnam War, said that "for SHSU students, I would say that seeing the wall is an opportunity not to be missed.
" Visiting the wall is one way we can offer our respect and thanks to those who sacrificed all for their country in a very controversial war." Olson said he will take his granddaughters to the wall so they can see the name of their second cousin, who remains missing-in-action.
" Since we are currently involved in another controversial war, visiting the wall, regardless of whether one agrees or disagrees with U.S. policy in Iraq, is a vicarious way of paying tribute and offering thanks to our soldiers," said Olson. Olson's four books on the Vietnam War are "Dictionary of the Vietnam War," "Where the Domino Fell: America and Vietnam," "The Vietnam War: Handbook of the Literature and Research," and "My Lai: A History in Documents." The Vietnam Veterans Memorial Wall in Washington contains the names primarily of more than 58,000 men and women who were killed or remain missing in the Vietnam War. The first part of a three-part memorial to be erected, it was dedicated November 13, 1982. Names are continuously added of those who have died prematurely of causes relating to their service. 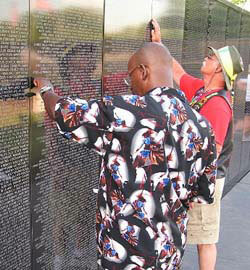 The Vietnam Wall Experience will stop in Huntsville between its stay in Waco, and its next stop in Tampa, Fla. It was created by the Dignity Memorial company, a national affiliation of funeral service providers.